To calculate the NBE, we collect information that is widely accessible to any consumer and run the data through a filter of 19 criteria. The resulting score is a quantifiable metric which takes the vague concept of brand into a number which can be tracked and improved upon over time. 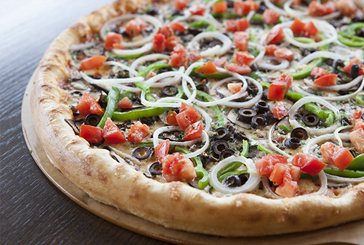 Two primary criteria drive a majority of consumer behavior in the specialty local pizza industry: price and convenience. For a local pizza chain to win a hungry customer’s business, they need to be in the right price tier for the budget, and be located close enough to make the choice easy. Beyond that, loyalty is won by truly understanding audience targets, using creativity and emphasizing personalization. Papa Murphy’s is the largest take n’ bake chain in the world. After building their brand on “freshest,” they are now attempting to own “largest.” Unfortunately, neither are highly defendable. Whenever we hear a CEO say, “We’re a category of one,” we get concerned. They’re not as in touch with their target audience as they might think. An iconic Seattle pizza chain that’s still family owned and operated, Pagliacci’s owns the local market for the highest-quality pizza. They provide dine-in and delivery across 24 locations. Their position as “best in Seattle” faces a tough challenge ahead. We make the case to focus more on creativity, history and environmental stewardship. 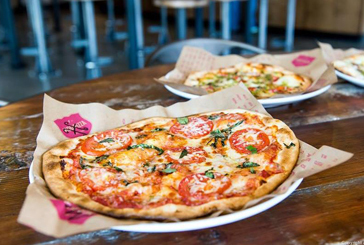 MOD Pizza has seen tremendous success with their fast-casual pizza concept. Culture plays a key role in MOD’s brand. As they rely on franchising partners to grow, sustaining the revolutionary fire may be difficult. We noticed some chinks in the armor—competing messages, unclear audience targets and a few technical missteps. Papa Murphy’s wins the location battle. They are the world’s largest take n’ bake chain, which makes them a convenient choice for customers. By far the leader in branded search terms, with even more searches for Papa Murphy’s than Papa Murphy’s Pizza. The only company of the three who is doing television advertising. Hard to determine a defensible point of difference. We’re looking for a insightful understanding of the family audience, affordability or a new way to set themselves apart on freshness. In-store environment and packaging are outdated, missing opportunities to strengthen the brand narrative. 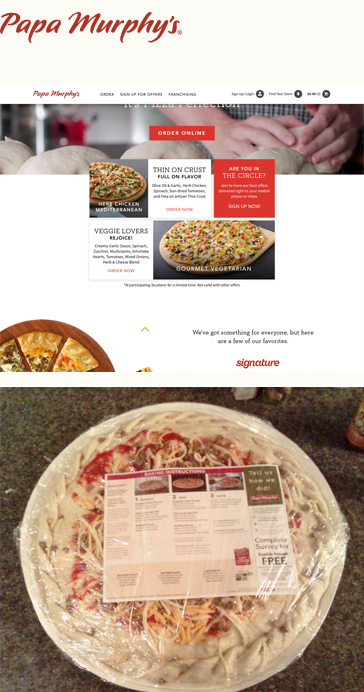 About Us page gives no explanation of their founding story or original owners, instead it shows a timeline of achievements and repeats messaging about their pizza quality. Own the emotional and practical space of the dinner table, and don’t assume you’ve already done this. Refine advertising to speak to moms AND dads, with specific distinctions for both working and stay-at-home parents. Complete the site redesign to reduce UX confusion. 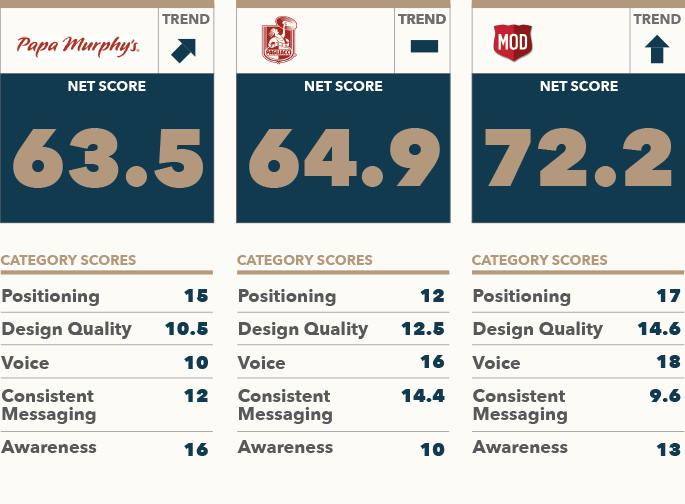 For a complete breakdown of Papa Murphy's scores, including actionable insights from each category, download the full report. 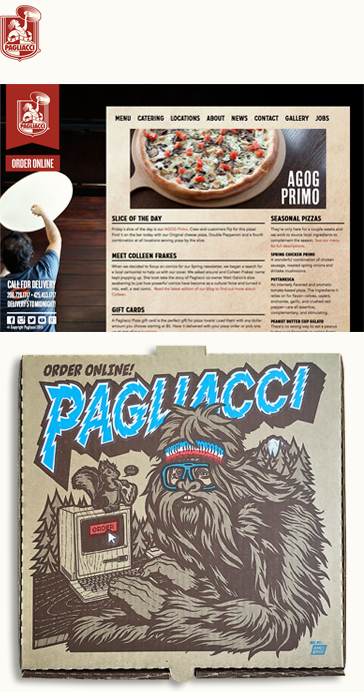 Pagliacci has the most fun, creative and memorable pizza boxes out there. The only company we saw doing content marketing; their print newsletter delivers interesting local news to 80k households. Pagliacci’s search engine results and social media messaging were the most consistent in the category. While it’s obviously a part of their culture, we couldn’t clearly identify a higher purpose. Confusing navigation on homepage, especially on mobile. It gives the impression of landing on a menu page immediately. Key messaging is absent. The overall tone of the brand feels slightly introverted rather than welcoming. Explore the customer segments who live within 7 minutes of your stores. Understand their emotions, buying habits, and specific ways to better relieve their pains. Update the copyright on your website to 2016 and keep a close eye on grammar errors in your blog posts. Bring in a fresh pair of eyes to look at your overall content strategy, including ways to maximize the impact of your 80k newsletter distribution list. For a complete breakdown of Pagliacci's scores, including actionable insights from each category, download the full report. Over $100M in venture-capital investment allowed MOD to rapidly expand locations, pump money into a compelling brand and build a superstar team. The fast-casual business model instantly sets their product apart from competitors. Each store is customized for the neighborhood. They also donate proceeds to charity with each new store they open. 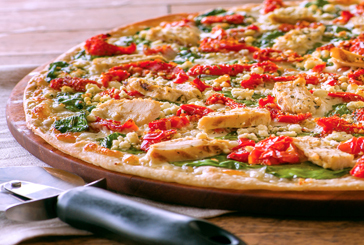 MOD uses three messages interchangeably: superfast, any toppings – same price, and individual artisan style pizzas. This can create customer confusion about what’s most important. 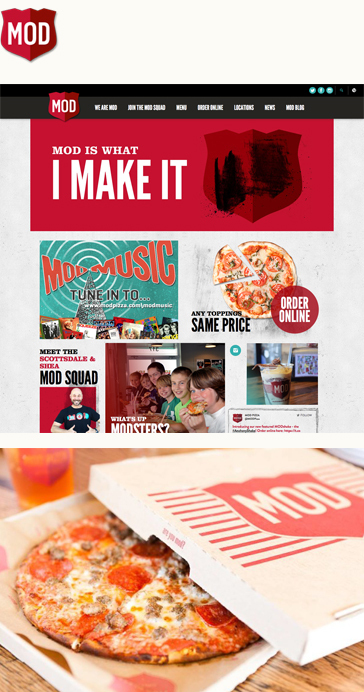 Revolutionary messaging such as, “I am MOD,” is only effective when brands are saving customers from a problem. MOD asks for our allegiance, but we weren’t sure what we were getting in return. We weren’t sure if their primary target audience was parents or young people (e.g. teenagers). Consider toning down the use of MOD-isms (MOD Squad, I am MOD, MOD Music, MODsters, MODness, MODshakes, etc). It gets old, fast. Both the homepage and menu page are missing meta descriptions, which causes search engines to display alt-tags. Fix this pronto. With new expansion goals, and the UK launch, now may be a good time to consider a highly targeted advertising campaign to share the MOD story with a larger audience and increase branded search traffic. For a complete breakdown of MOD's scores, including actionable insights from each category, download the full report. The full 14-page report includes a breakdown of our entire process, the complete list of scores within each category, and actionable insights for improvement from our design and brand teams.